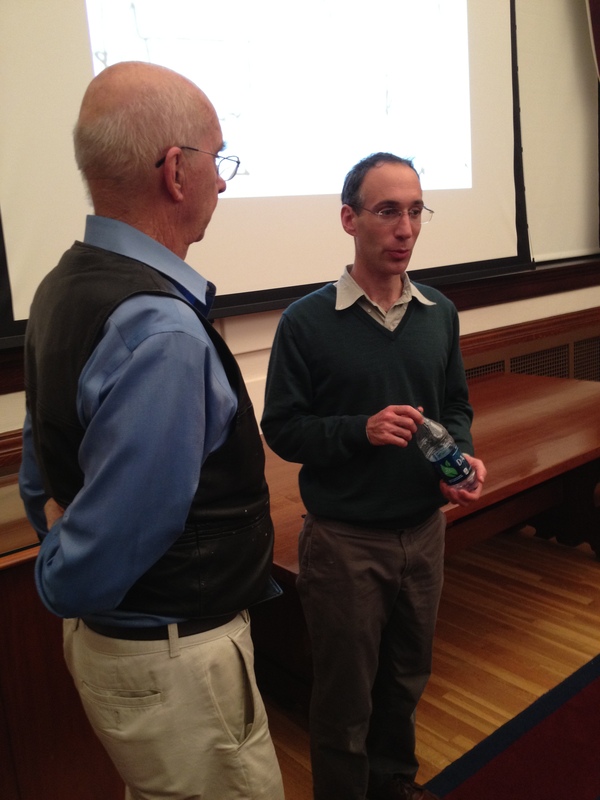 NESW member Bob Cooke (left) talks to HMS geneticist David Reich (right). David Reich, a genetics professor at Harvard Medical School, talked to the New England Science Writers recently about what his genetic studies have revealed about the evolution of archaic and modern human populations. Here is a report by Jeff Hecht, New Scientist correspondent and NESW steering committee member, who organized the Oct. 4 event with logistical support from David Cameron, HMS science communications director. Reich’s work is based on analyzing the fragmentation of chromosomes and the rearrangements of genes that occur over many human generations. Comparing the degree of changes can tell us when two populations diverged, and how “archaic” populations have contributed to the ancestry of modern populations. The research that has garnered Reich the most attention has identified the genomic connections archaic populations and modern humans. Mitochondrial DNA studies had found no evidence of interbreeding with Neanderthals. But results of his whole-genome sequencing research, reported in Science, shows that Europeans share about 1% of their ancestry with Neanderthals, with Asians having a little more and Africans having no significant share. Ongoing research seeks to pin down details. Genomic sequencing by Reich has also identified a previously unrecognized group of archaic hominims that have been dubbed Denisovans because their fragmentary remains (a finger bone and two molars) were found in the Denisova Cave in the Altai Mountains in southern Siberian. The Denisovans appear to have been a very small population. Reich’s group has found that among the populations now living, those who carry the largest amount of Denisovan genomic material are the aboriginal people of the Philippines, New Guinea, and Australia. Reich’s landmark paper on Denisovans was published two years ago in Nature and he followed up with another paper last year in the American Journal of Human Genetics. His group has also analyzed the genomes of natives of the Indian subcontinent since the end of the Ice Age about 10,000 years ago. Some 70 ethno-linguistic groups can be identified among modern Indian villages. All these groups are mixtures of two ancestral groups from northern and southern India, and Reich has discovered that the mixture occurred 80 to 180 generations ago, or roughly 1,700 to 4,000 years ago. He said this might be related to historic events and migrations into the region. Debra Ruder, an NESW member, has an excellent piece about Reich and his research in the winter 2012 issue of Harvard Medicine magazine. And here is a New York Times story that ran earlier this year about Reich’s research supporting a theory that North and South America were populated by three migrations from Siberia.